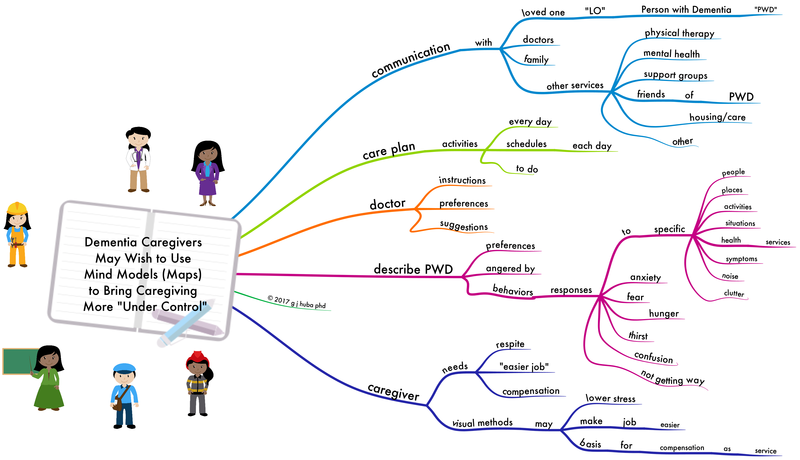 Since 2012, this blog has tried to help persons with dementia and their caregivers learn to use mind maps and other visual thinking tools to simplify the journey through dementia and lessen some of the burdens placed upon caregivers and persons with dementia. Mind mapping and other visual thinking tools are ways of representing ideas and communicating through pictures and diagrams. 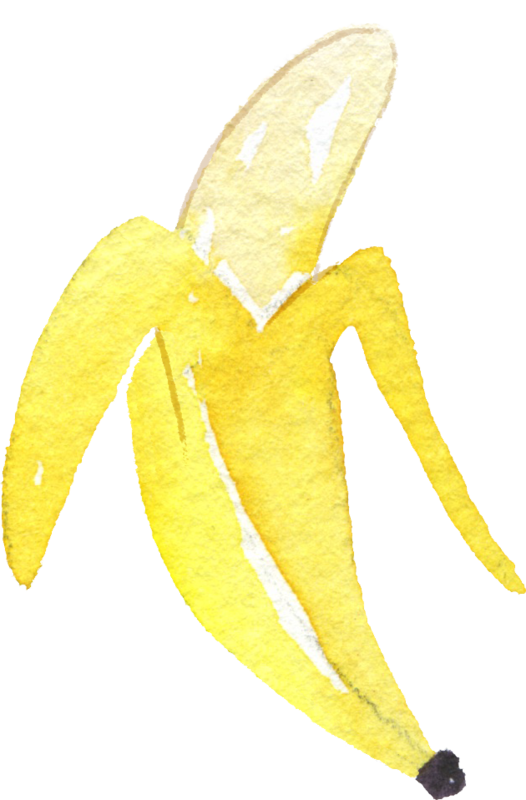 In addition to mind maps, other useful visual thinking tools are sketchnotes, doodles, diagrams, and photography. I focus on mind maps because that is what I primarily use, but sketchnotes and other ways of representing information are also good. Note that while I use computer programs, you can draw any of these diagrams with a piece of typing paper (if this is not big enough for you, tape a few pieces together), a pencil or pen, and a little care to print legibly. It is best to use a few colored pencils to make the diagram a little clearer but not necessary. The important part of the diagrams is the organization and the words (ideas) you express. The mind map below shows some of the people who might benefit from your diagrams including the person with dementia and YOU. 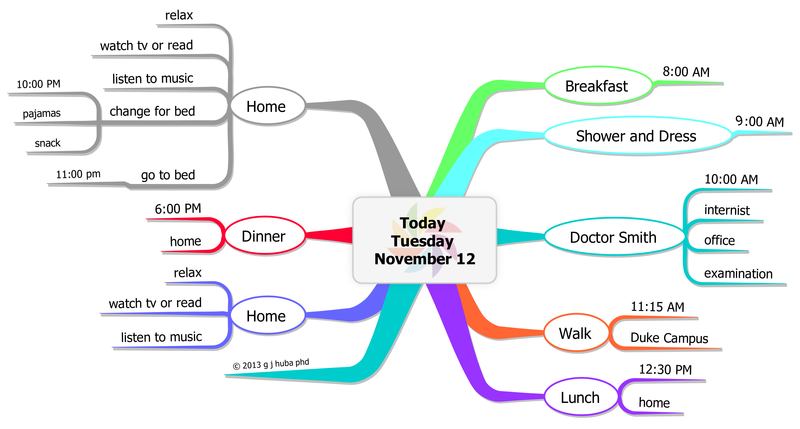 Mind maps are a very powerful way of presenting information to others and organizing and remembering your thoughts. Virtually any kind of information can be presented in a diagram. Here are some examples. As you collect such information you can make it available to others. 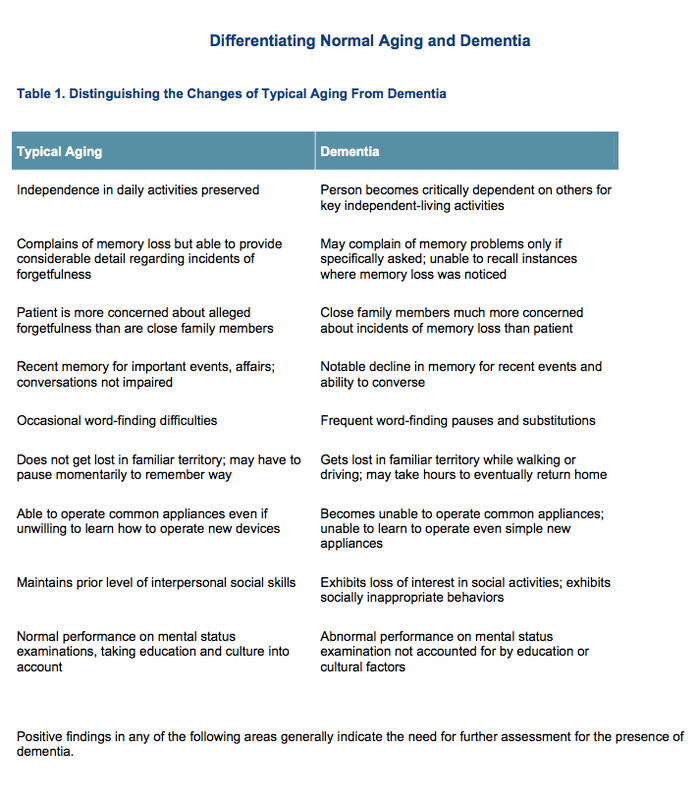 Persons with dementia benefit from knowing their schedules and what is coming up. It cuts anxiety. 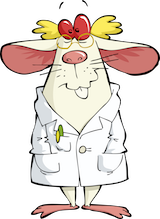 Doctors can absorb information from you rapidly, in context, and accurately. My internist and neurologist like to see them. 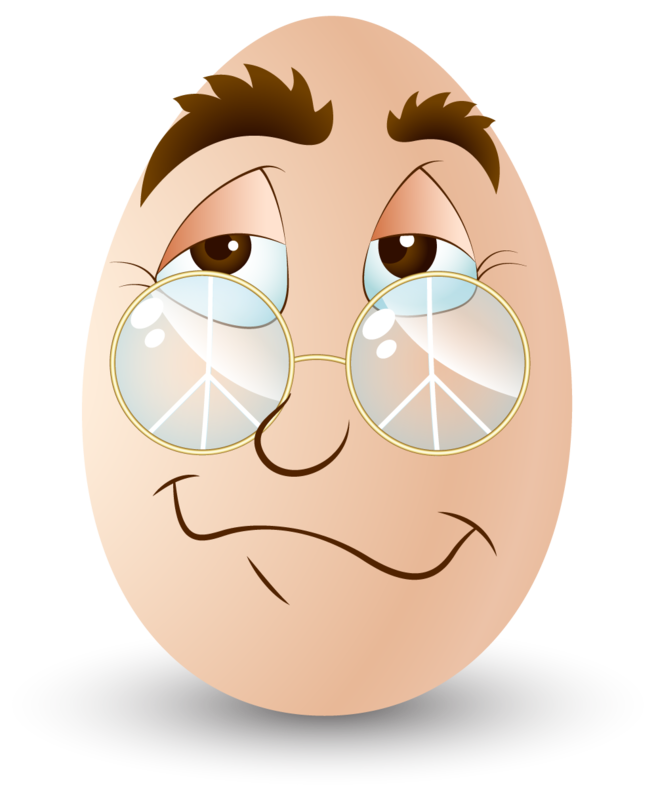 Family members will like to see what is going on, and this is a way to manage and increase their own involvement in care. Mind maps about what the person with dementia likes and behaves can make your job an easier one for others to assume so that you can have some well-needed respite. Care notes can help everyone know what has been going on for the person with dementia. 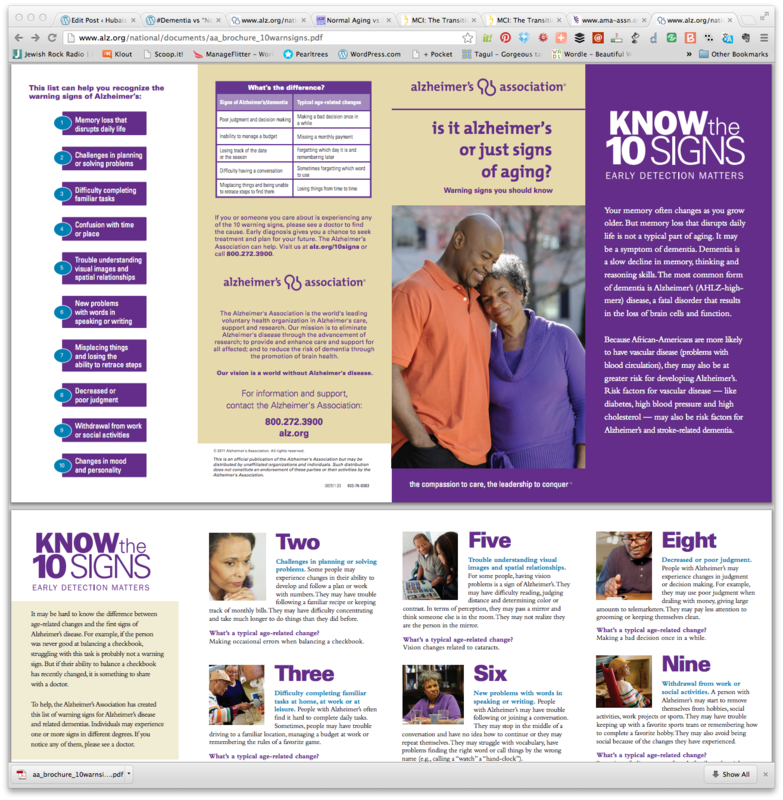 Dr Rita Jablonski-Jaudon has a really nice article on 10 rules to follow in order to provide effective, compassionate, and comprehensive Alzheimer’s caregiving. Dr. Jablonski-Jaudon is an expert on Alzheimer’s care, and I have greatly respected her judgment over the decade I have known of her work. 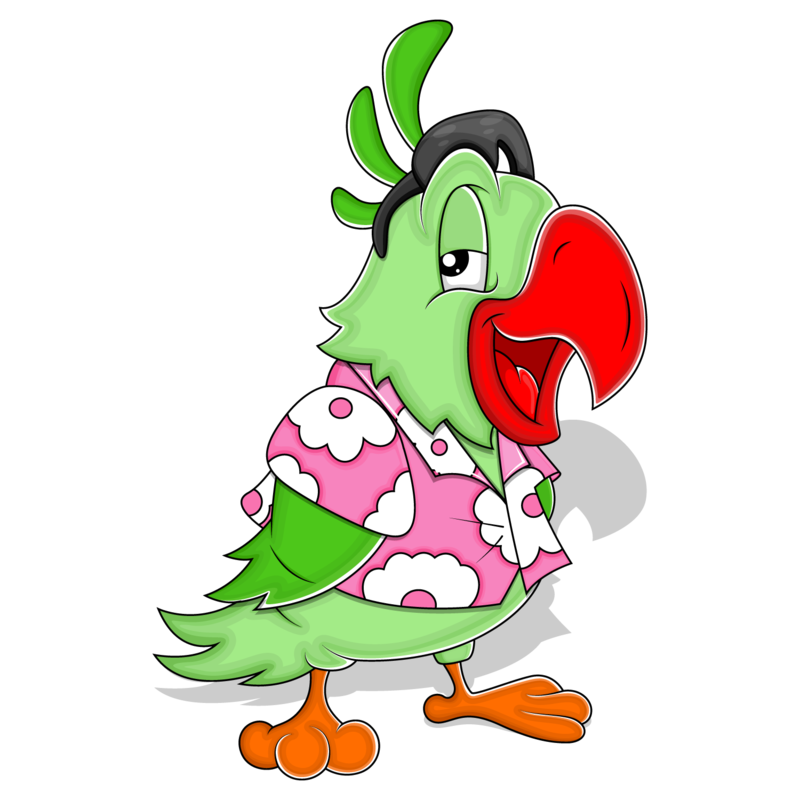 The article may be accessed here. Clicking the link will open a new window. 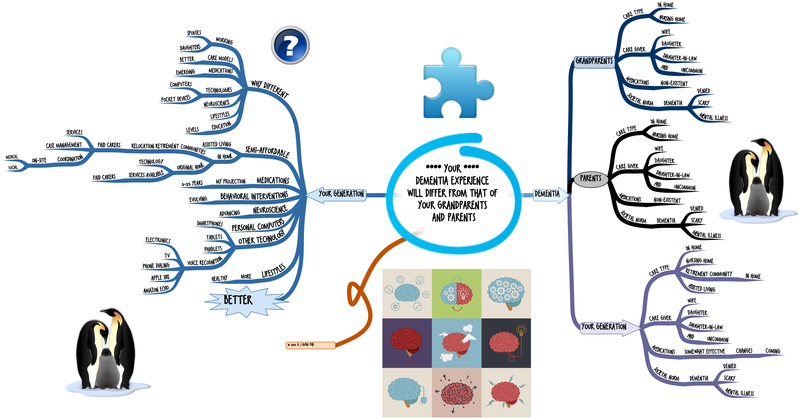 I wondered if the information could be presented in a somewhat more compelling way visually as a mind model (AKA mind map) with a very large (some would say excessive) number of images embedded in the diagram. So I tried this afternoon. I like the result; hopefully Dr Jablonski-Jaudon will also. Spend a few minutes looking at this and the images, and I suspect you may view caregiving in a somewhat different way. Note that you should read the original short article either before or after looking at the mind map. There are some further explanations of concepts in the original piece. I have argued for several years, especially in my book “Mind Mapping, Cognitive Impairment, and Dementia,” that communication among persons with dementia, their caregivers, and healthcare providers can be greatly improved by using visual thinking methods. 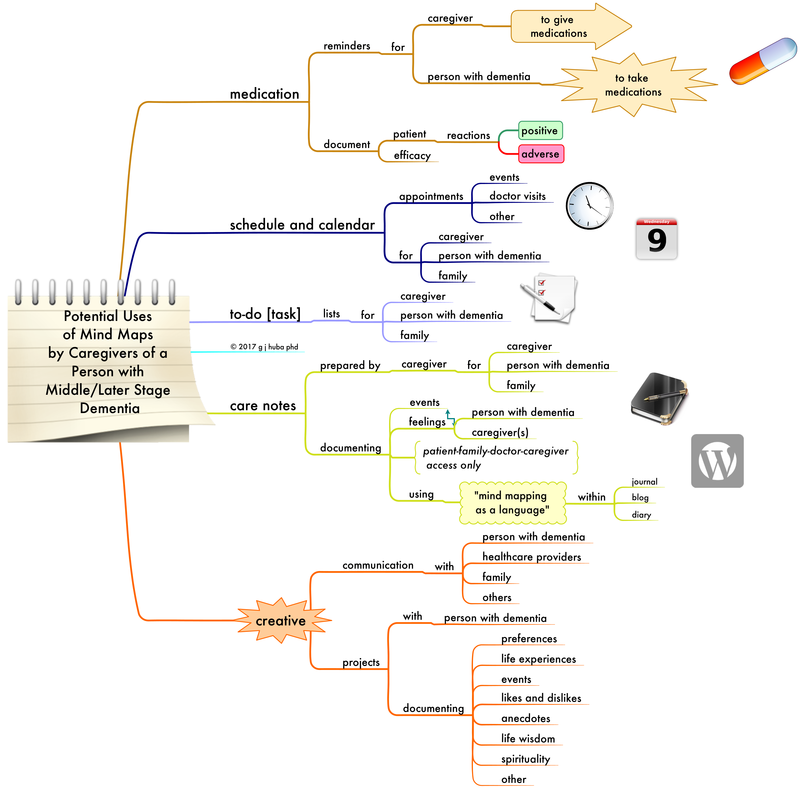 Mind maps are probably easier to understand for many persons with dementia than the traditional forms, small font information sheets, lists of to-do items, pharmaceutical labels, and guidelines. 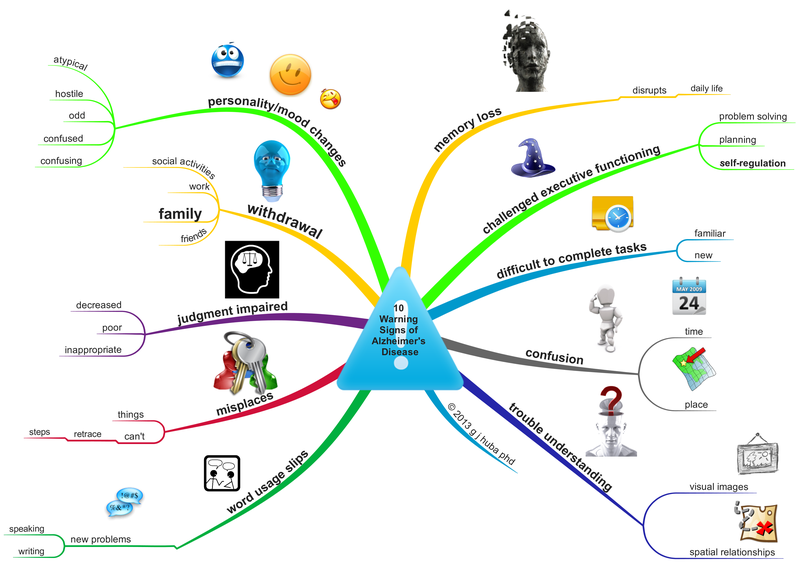 Mind maps can be used for visual journals and diaries that can still be understood at later stages of the disorder. To use these methods effectively, it is imperative that healthcare providers and caregivers be trained in effective mind mapping methods. 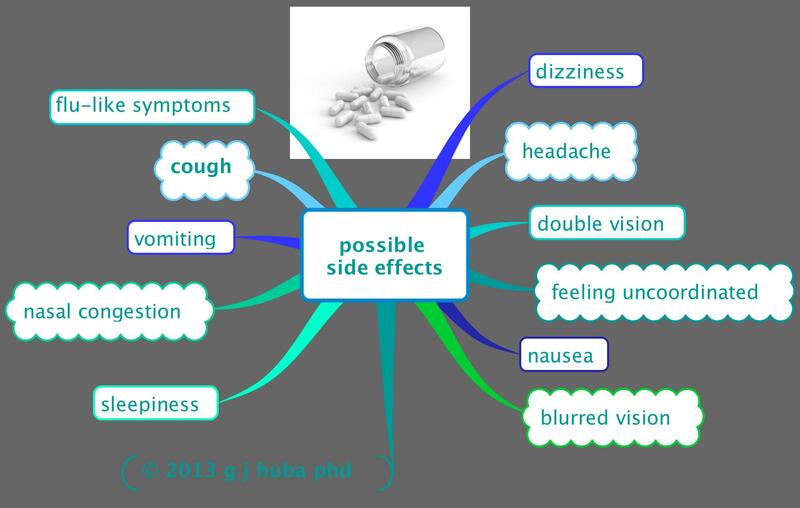 While many medical students are shown how to mind map, the techniques used are actually very ineffective ways of visual outlining that employ few, if any, of the real strengths of the method. These outline maps are clearly not appropriate for persons with dementia. Hence caregivers and healthcare providers need to be trained in “real” mind mapping methods AND how to communicate with these methods with persons with dementia. Most of the trainings and mind mapping books and web sites are oriented to business users, especially at the management level. I have yet to find training sessions especially geared to both the mind mapping and patient care and management issues implicit in healthcare and caregiving. 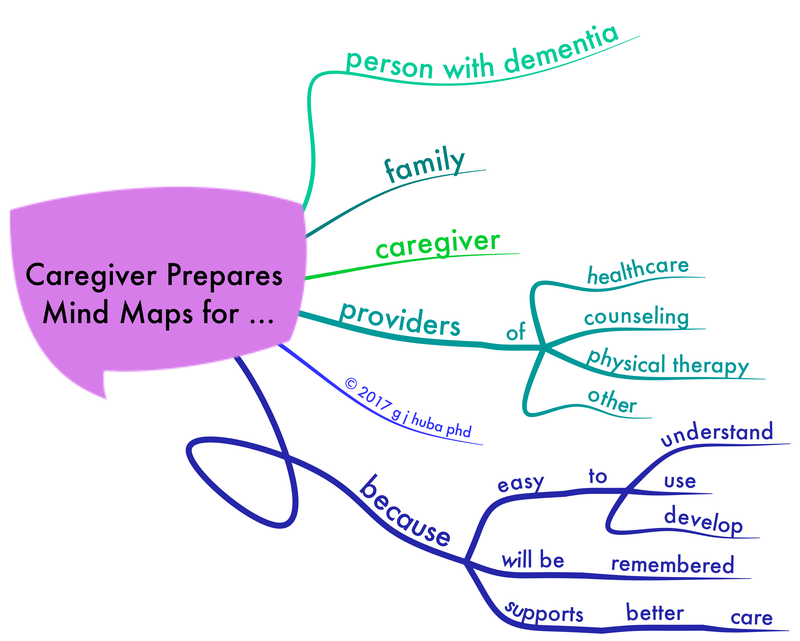 So how should we train healthcare professionals and caregivers to use mind maps effectively for the benefit of the person with dementia? 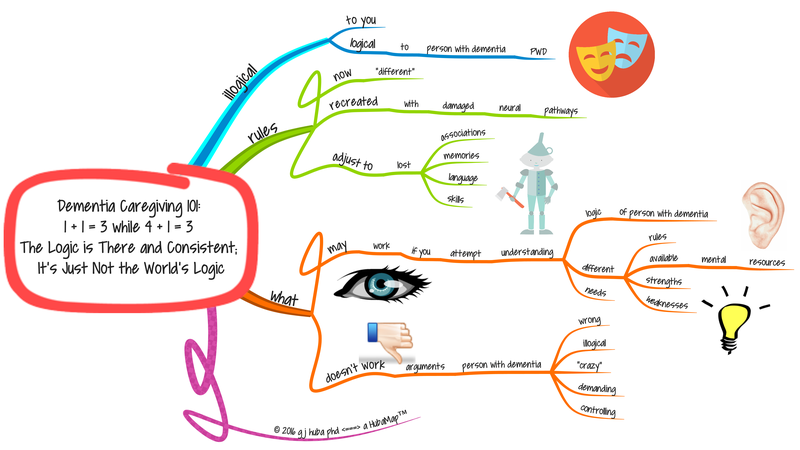 The following mind map is a set of suggestions for how to train such individuals effectively. The trainings are designed to produce mind mapping experience specifically focused on patient care and management of those with dementia. One of the things that has frustrated me in the past six months is that as I look back over 60 years, I would like to be able to organize much of the information I accumulated in mind maps into something that looks like a time line. I did learn a while ago about the absolutely fantastic time line mind maps developed by Hans Buskes (@hansbuskes on Twitter; http://mastermindmaps.wordpress.com/) and Philippe Packu (@IPhilVeryGood on Twitter; http://www.drawmeanidea.com/). These guys have some incredible examples. Far beyond my artistic ability. So I kept using regular mind maps with a first branch being a year or range of years. The example below shows my reactions to the presidencies of the individuals who served as POTUS during my lifetime. But, notice a little trick I introduced. Instead of the year branch coming directly out of the central idea, I have a “blank” or filler branch and then the time period branch comes out of that. No big deal. Just like a regular mind map with a little piece of formatting. What I discovered is that my adding the extra (padded) branches in the mind maps like those above, it then takes just about 10 minutes (I need more practice) to go from the mind map above to the one below. All you have to do is turn off the automatic routine for changing the positions of the branches and drag them around a little. You get the the nice straight line by pinning each of the extra padded branches along a straight line and then letting little time-cluster mind maps grow at the various temporal nodes. Takes almost no time. (Ok, so I did stop and do a little font and picture formatting but it is no big deal). 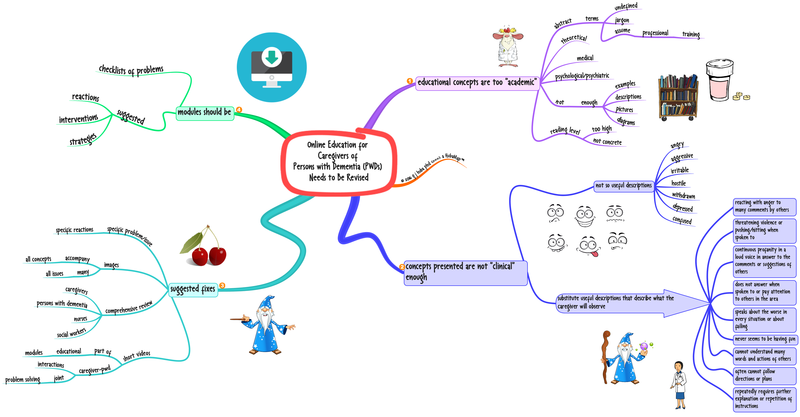 All of these good things happen because the program I used (iMindMap) has a feature that permits you to pin some or all of the branches into specific places. In this case you just have to pin the one padded branch for each of the time nodes. Want a 3D timeline? 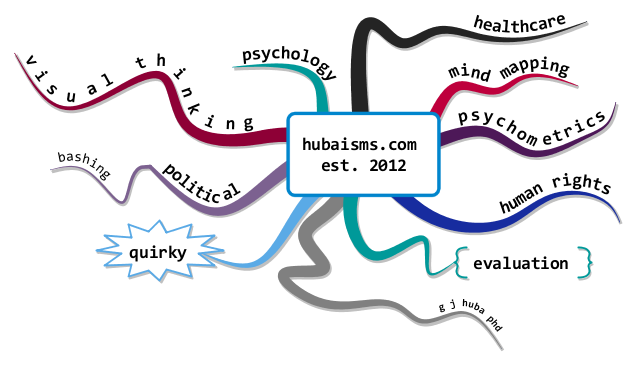 Hit the button in iMindMap and you can have one like that below. Note that you also can treat the timeline as a “regular” iMindMap in terms of changing fonts, colors, styles, and adding clip art and images. Kind of cool. I was heavily influenced by the work of Hans and Philippe: this is my attempt to simplify it. Want a timeline presentation? Yup. There’s a button for that too.